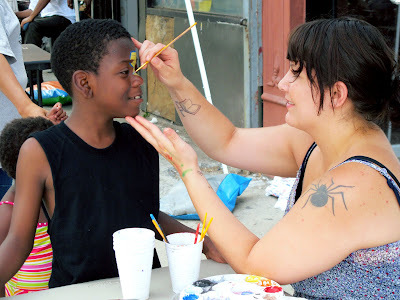 Thanks to Jillian Bergman for the photos - it looks like a fantastic day out for the children of Crown Heights. 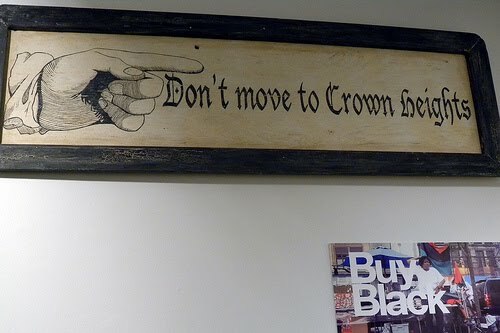 With Crown Heights Gold opening tomorrow, I thought I'd post a piece that tackles some of the same issues that this exhibit considers. Way back in January, ILFA took part in a reading featuring alumni of the Crown Writes writing workshop, where I read a long, overwrought post I'd put together about a series of local encounters with race and neighborhood change, including a visit to MoCADA's "The Gentrification of Brooklyn: The Pink Elephant Speaks." After I finished, a fellow alum and lifelong Crown Heights resident, Baruch Tauber, read a reflection of his own that included a reaction to some of the same artworks in the MoCADA exhibit that I had written about. One early spring afternoon, I sit in Lefferts Park in Crown Heights, Brooklyn. 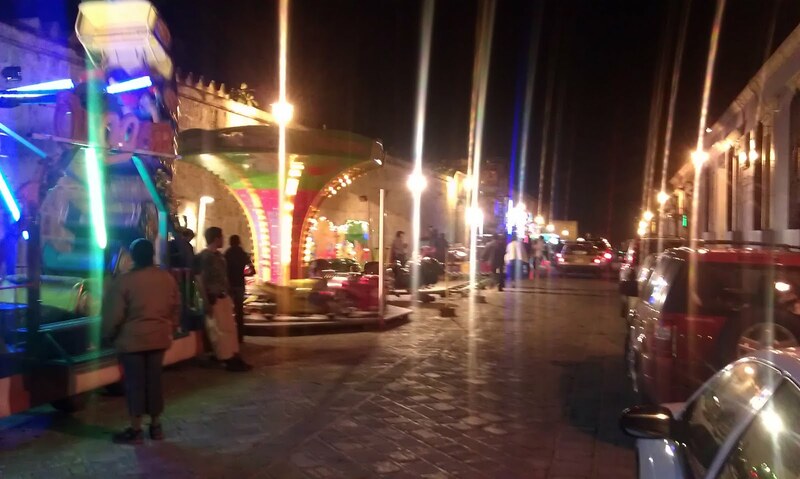 The park is familiar from youth... The children’s playground, where in the dog-days of summer, the squealing and splashing in the sprinkler can still be heard, the towering concrete walls of the handball courts, a sport once more popular in the ‘hood, now lie dormant, covered with debris and leaves from last fall. The baseball field. A grassy haven in a world of concrete, where on hot summer days you could lie on your back, stare at the clouds, and run your hands through the grass while dreaming of school’s end and sleep-away camp in those exotic Catskill mountains where soft meadows, thick pine trees, and cool lakes were as abundant as the grime a grit of the hot, sweaty city streets. The grass on the field is gone now, replaced by a synthetic green carpet, and soccer seems to be the more popular sport nowadays... Come to think of it, baseball never quite was the ideal sport for this space. 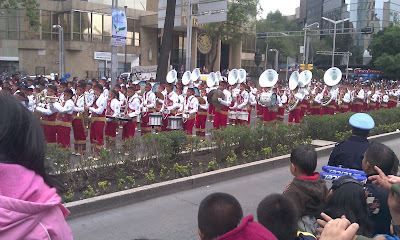 Often, multiple games would be going on at the same time, each group with its back to the other on the improvised field. In the outfield, you’d often here an urgent call of warning: “HEADS UP!” but you didn’t know which way to turn! In addition to being the only large open, “green” space in walking distance, the baseball field served as the only public space that defied the community’s social and racial boundaries. Crown Heights is made up of mostly Caribbeans and Afro-Americans, and a minority of Hassidic Jews and Latinos. During the turbulent 80’s and early 90’s, it was a breeding ground for racial conflict, and since the riots of ’91, and the tense calm that endured, Blacks and Jews tried to keep out of each other’s way. While most of the local kids attended public school, us Jewish kids attended a religious school. This limited our interaction, and we seldom socialized on the street nor saw the interior of each other’s homes. 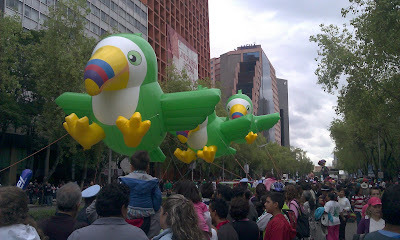 The public shared space of the park forced us to interact. It was here we clashed over who had the field first; it was here we learned how to mediate. 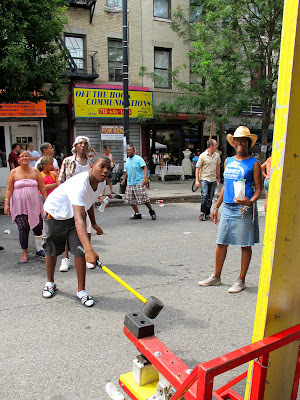 This summer marks twenty years since the 1991 Crown Heights Riot, an event which continues to shape perceptions of, and lived experience in, the neighborhood, and which many community institutions will be remembering in one way or another over the coming months. At the Bedford-Stuyvesant Restoration Corporation, just north of Crown Heights on Fulton at Marcy and New York Avenues, an exhibition opens this Thursday from 6-8pm in their Skylight Gallery "examining race relations and healing in Crown Heights." The exhibition will be up through October - click on the flyer above or read on below for more details. 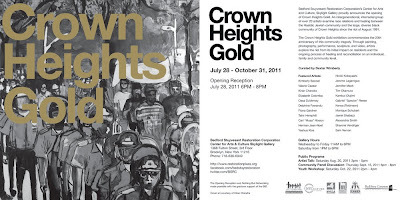 The Skylight Gallery is pleased to announce the upcoming exhibition Crown Heights Gold: Examining Race Relations and Healing in Crown Heights, Brooklyn During the 20 Years Since the 1991 Riot, curated by Dexter Wimberly. Using contemporary art as a vehicle to foster dialogue and remembrance, this exhibition commemorates the 20th anniversary of the Crown Heights Riot, and explores the transformation of the community since the harrowing incident. The multi-media exhibition will feature painting, drawing, photography, mixed media, video and sculpture created by roughly twenty New York-based visual artists. To compliment the exhibition, a calendar of public programs is being planned in collaboration with community leaders and organizations. The activities will look at the work done in the neighborhood post-riot, as well as the ongoing state of cooperative efforts to encourage continued inter-group communication and understanding. Skylight Gallery Hours: Wednesday to Friday from 11AM to 6PM and on Saturday from 1PM to 6PM. 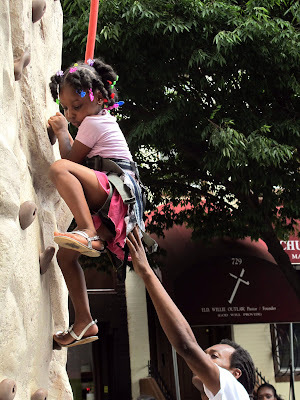 Even if you haven't put on your schedule yet, it's not too late to wake up, read this, and amble outside to lend a hand at the 4th Annual About Time and CHCA Franklin Avenue Kids Day. It's a great day out - you'll be glad you did. Also, for all locals looking for work, The Candy Rush is looking to hire someone with an NYC food protection certificate. Hit them up tomorrow if you've got the qualifications. Last year's Kids Day video - yours truly shows up somewhere around the four-minute mark. The lady and I stumbled upon a huge kid-friendly family festival/parade in Mexico City (two photos above) last weekend, and it made us positively homesick for Franklin Avenue and the Kids Day, which was some of the most fun either of us had last summer. If you're in the neighborhood, don't miss it, and if you've got even a few hours, consider volunteering. People will be setting up from 8am, and the event runs 10am - 5pm, with clean-up afterward, and I guarantee that if you go intending to just help out for a little bit, you'll end up having a blast and hanging out until the last child has wandered happily home. If you want more info, contact the CHCA, or wander into About Time or The Candy Rush, where they'll tell you all about it. Kids Day and More This Saturday! The hoppin' block between Park and Sterling is getting another new business, opening in eight short days. There's more information in the press release, below. Also, nearby on Nostrand, Anthony Mackie was tending his bar (and he built it himself, as in with his own two hands, which I did not know) at NoBar over the weekend. 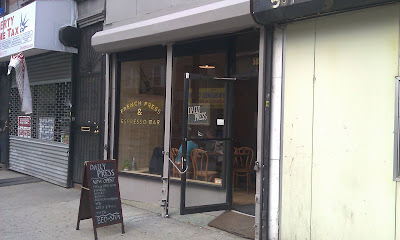 Owl & Thistle General Store will open at 720 Franklin Ave (between Park Place and Sterling) in Crown Heights on Wednesday, July 27, 2011. Owl & Thistle General Store is a new take on an old-fashioned concept of a community oriented store offering a wide variety of products under a single roof. Items available include greeting cards, women’s clothing, small batch food items, kids toys and clothing, bath and body products, home accessories, jewelry, totes, purses, and more. We specialize in local, sustainable and fair trade goods at affordable prices. We scour the world and our own backyard so you’ll be able to find McClure’s Pickles and Granola Lab granola made by our neighbors in Crown Heights as well as purses, pillows, and other accessories from the Awava women’s cooperative in Uganda, just to name a few. We carry greeting cards beautifully crafted from sustainably harvested wood and soy ink, all natural play dough in aromatic varieties like cardamom, lemongrass, and lavender, and various clothing pieces created by local designers. The proprietress, Keri Cavanaugh, is well acquainted with local products and fair trade. A long time independent clothing designer and former Peace Corps volunteer, she brings her love of practical yet beautiful wares to Owl & Thistle General Store. You can be assured she will bring a collection of carefully chosen products that cater to all members of the community. New items will continuously be added so stop in often. Nestled in the heart of Crown Heights, Brooklyn, Owl & Thistle will be open Wednesdays - Saturdays 11-7 and Sundays 12-6. For more details visit www.owlandthistlegeneral.com. Caffeinate with the ones you love…. 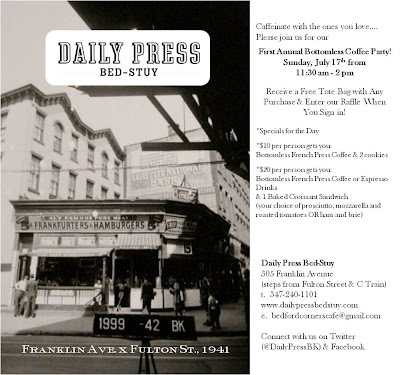 First Annual Bottomless Coffee Party! & Enter our Raffle When You Sign in! Help Bring a Bike Lane to Franklin! (Editor's Note: I've started putting myself in italics when I'm copying a lot of text, instead of the other way around). The folks at the Crow Hill Community Association are passing the following petition around - you can find copies to sign at Dutch Boy Burger, Had Associates, Franklin Park, and The Candy Rush. You can also print out a copy of this exact language and sign it (name and address), share it with your friends and neighbors, and hand it in at one of the above locations. A continuation of the Franklin Bike Lane would be great for everyone who uses the Avenue, including drivers, because as is they have to navigate around bikes in a very narrow, poorly-marked, not-quite-two-lane space. A lane makes it safer and easier for everyone, and would help bring more foot and bike traffic to the area's businesses. We, the undersigned support Crow Hill Community Association’s proposal to convert the 2 existing traffic lanes on Franklin Avenue between Atlantic Avenue and Eastern Parkway to 1 lane of vehicular traffic and 1 designated bike lane. This would make traffic conditions on Franklin Avenue safer for pedestrians as well as create a secure thoroughfare for cyclists continuing on Franklin to Crow Hill/Eastern Parkway/Prospect Park from the designated Franklin Avenue bike lane that currently exists north of Atlantic Avenue. It's vacation season, and tomorrow we're hosting our third annual "TRAVELS AND JOURNEYS" reading. Locales range from a small village in Trinidad to post-apocalyptic 34th century Virginia. This year's event has a strong local feel, featuring neighborhood literary celeb JAMES BOICE; Crown Heights's favorite stand-up comic and host of the Comedy Nights show at Abigail's, STEVE CARR; and Prospect Heights resident VICTORIA BROWN, whose autobiographical novel MINDING BEN centers on a young Trinidadian immigrant working as a nanny for privileged NYC families while living in riot-era Crown Heights. JASON DIAMOND, editor of Jewcy.com and the popular literary blog Vol. 1 Brooklyn, and JULIA JACKSON, an Electric Literature correspondent and recent Brooklyn College MFA grad, round out the lineup. As always, admission is FREE and we'll have a $4 pint drink special. PLUS, we'll be raffling off books from James Boice and Victoria Brown. Details -- link to FB event page and pasted below. FRANKLIN PARK READING SERIES -- "Travels and Journeys Night"
JAMES BOICE was born in 1982 in Salinas, California and grew up in northern Virginia. The Good and the Ghastly is his third novel. He is also the author of the critically acclaimed novels MVP and NoVA, and his work has appeared in Esquire, McSweeney’s, Fiction, Salt Hill, and other publications. 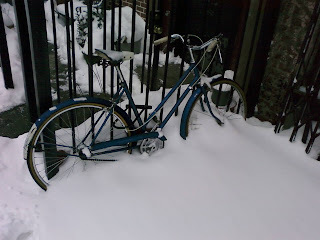 He writes about pathological people and lives in Crown Heights. VICTORIA BROWN was born in Trinidad and at sixteen came alone to New York, where she worked as a full-time nanny for several years. She majored in English at Vassar College before attending the University of Warwick in Coventry, England. Eventually, she returned to New York, where she taught English at LaGuardia Community College. She is now completing her MFA at Hunter College. Victoria lives in Brooklyn with her husband and two young children. She has a part-time babysitter in her employ. JASON DIAMOND is the founding editor of Vol. 1 Brooklyn, the editor-in-chief of Jewcy.com, and has had work appear at NPR, Vice, The Rumpus, and many more outlets. He is currently at work on his first book. Ask him about it. JULIA JACKSON was raised in Southern California and currently teaches at Brooklyn College, where she earned her MFA in Fiction Writing in 2011. She is a regular contributor for Electric Literature's blog, The Outlet, and her work is forthcoming in the New Ohio Review. STEVE MAURICE CARR is a man of many talents. Born in 1985, Steve’s been a poet since the age of 15. He fell in love with stand-up comedy two years ago while working as a busboy at Abigail Cafe and Wine Bar in Crown Heights and now co-hosts the Comedy Heights show at Abigail’s each Tuesday. He has performed on numerous New York stages, including the Nuyorican Poets Cafe, Comix, the Tank, and the Laugh Lounge. 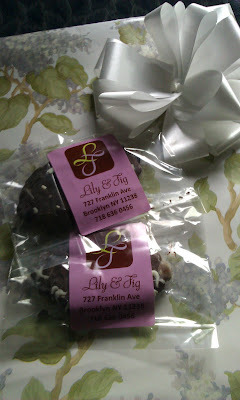 Sorry for the short notice on these - ILFA got married last night! 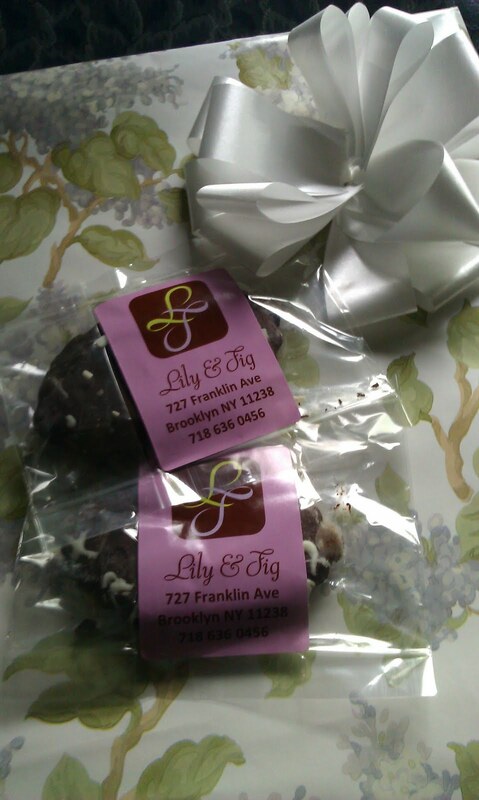 Lily and Fig provided our wedding favors (above), so even though we weren't in Brooklyn, Franklin Avenue was represented. 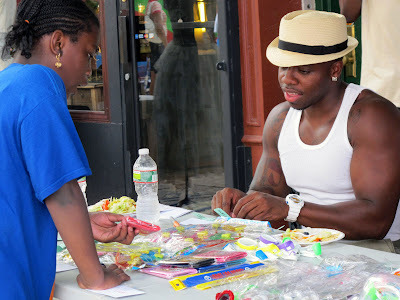 The Built in Brooklyn Craft Fair is back after a successful first event in June, until 6pm. Hand-made jewerly, greeting cards, food, gifts and clothing from ALL LOCAL-AREA ARTISANS! Sue Rock Originals, fresh off a Woman of Valor Award for their fantastic work, is hosting a "Libations and Summer Shopping Event" this afternoon and evening! Summer is here and we invite you to come by, have some food, some libation and see what goodies are available from our Summer 2011 collection. As you know, Sue Rock Originals makes beautiful women's separates which are flattering to every figure. This season we have colorful jersey circle skirts, lace shrugs, easy wearing caftans and the our convertible dress. in a great range of sizes and fabrics. Also we will be offering our CONVERTIBLE DRESS for $125 with fittings available and orders taken at our shop! The Walt L. Shamel Community Garden (1095 Dean Street, between Franklin and Bedford) is hosting free outdoor movies every Wednesday in July, weather permitting. Enjoy an evening of film in our beautiful garden with your friends neighbors. Admission is free, and we will have refreshments for sale. Many people have already seen the following message from the Crow Hill Community Association, but if you haven't, the NYPD (under budget pressure, though they don't couch it in those terms) is reallocating officers deployed in Impact Zones (of which Franklin Avenue is one) to the WTC Command, as reported on Friday in the Daily News. This means, of course, that some Impact Zones will get the ax, and the CHCA is organizing to ensure that Franklin, which has been an Impact Zone for over a year, remains one. ILFA has trod this ground recently, and I pass this message on with some ambivalence. Crime along Franklin is undoubtedly down from a few years ago, when ILFA spent the summer reporting a rash of shootings along the Avenue, and while demographic changes have certainly played a role in this trend, the work of the NYPD, CHCA, and Impact Zone officers has made most of the difference. Nonetheless, crime remains a real problem in Crown Heights - Propsect Heights Patch reported a spike in rapes this June, and the work of SOS Crown Heights is a reminder that gun violence continues to take lives in the neighborhood - and residents are certainly justified in organizing to preserve the police presence in the neighborhood. "Zero tolerance" policing, however, remains hugely problematic, and all too often marginalizes and quickens the disintegration of communities it purports to protect. I wrote about this after the abusive arrest of a community leader and the helicopter incident (Patch reports that one family involved in that clash is suing the police), and I remain unconvinced that the NYPD has taken any steps to address the extremely high social cost of stop-and-frisk, quota-based policing that criminalizes Black and Latino youth. Bob Herbert (a Brooklyn native) did much in his final year at the New York Times to bring what he called "Jim Crow Policing" to light, and a recent NYT article notes that many African-Americans cite police harassment as a reason for leaving New York (New York City's Black population shrank from 2000 - 2010, the first time the city had registered a net loss of African-Americans since 1880). For more on how zero tolerance policing has gone awry, take a look at this piece by a former NYPD officer about his time in an Impact Zone in Alphabet City and the Village Voice's "NYPD Tapes" series about quotas in Bed-Stuy. That said, the Crow Hill folks have been working hard for Franklin Avenue for 26 years and counting. The diversity (of race/ethnicity, age, and economic status) of their membership and leadership committee is a testament to their mission to serve everyone in the neighborhood, and they believe that having an Impact Zone is better than not having one. I believe they will work as hard as they can to hold the NYPD accountable, and if they succeed in keeping the Impact Zone, it will be incumbent upon all of us who support them to help ensure that local policing serves the entire community. Crow Hill Community Association has worked very closely with the 77th Precinct to help insure that this program is a success. but we have learned that there is a strong possibility that we may lose this additional police protection. We are asking EVERYONE to weigh in on this issue, NYPD needs to hear our voices or theImpact Zone will move to a more vocal community. Please urge your neighbors to get involved, especially if you live in an apartment building. Impact is the NYPD program that deploys foot patrol to communities in the City where the need is the greatest. The Impact Zone officers are rookies, this is their first assignment out of the Academy, this is their training ground. Impact Zones are considered "Zero Tolerance" areas. The goal of Impact is to create better quality of life on our streets; a factor that is shown to have a great effect on the reduction of crime in a community. This means that minor offenses (littering, spitting, bike riding on the sidewalk, etc.) are more subject to summonses this is something that we all need to be aware of. While Franklin Avenue has improved greatly over the past few years, we still have the potential of being overrun with illegal activities including robberies and street drug sales along with its associated gun violance. Crow Hill's residents and merchants still need the Impact Zone. 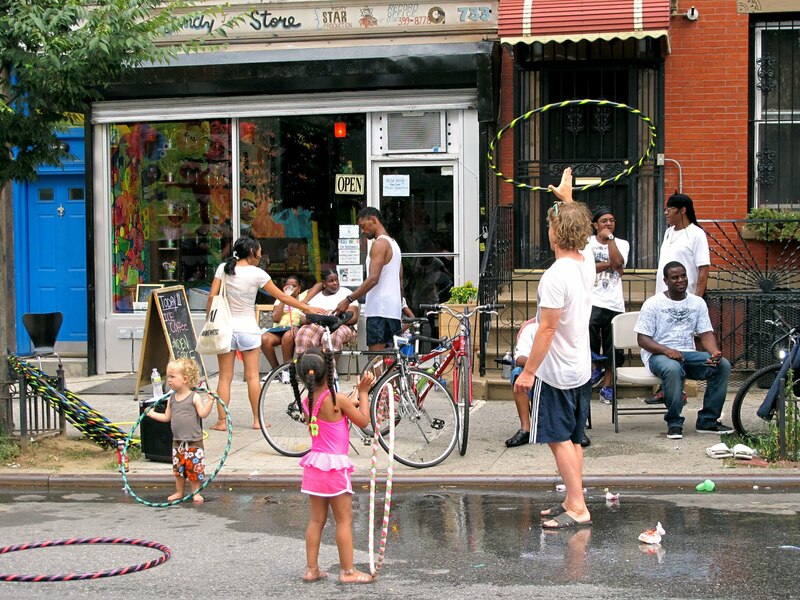 One of the most important factors in establihing safer communities is creating a vibrant and positive community street life, the Impact Zone has given us the opportunity for this to flourish on Franklin Avenue. This in turn has lead to the recent boom of new businesses. CHCA has worked very closely with the 77th Precinct to help insure that this program is a success. We are aware that there have been incidents on the Avenue where community residents have had negative experiences with Impact Zone officers. This is also of concern to us and we have had several beneficial meetings with the 77th Precinct on this issue. We have also had discussions on this topic at our last two meetings. We welcome your concerns. Please contact us if you would like to discuss anything relating to this issue or if you would like us to facilitate an opportunity to actually address the impact officers directly at roll call before they are deployed daily to Franklin Avenue. 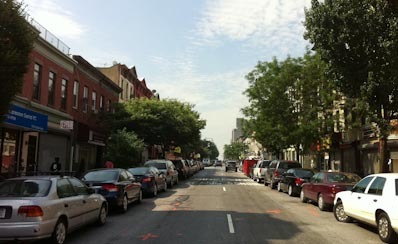 I have been a [merchant/resident] of the Crow Hill section of Crown Heights for [ ] years. I am writing in support of keeping the Impact Zone on Franklin Avenue. With the increased foot patrol the Avenue has been able to flourish, new businesses are opening and community spirit has greatly improved. I am afraid that without the additional police presence, our street corners will once again be dominated by threatening groups of individuals conducting illegal business. With the rise of drug activity on our streets comes an increase in both gun violence and the random muggings and break-ins that can plague our community. Franklin Avenue has come a long way over the past few years and we are grateful for the attention that Brooklyn North has given our community but we are not out of the woods yet. With schools out for summer and fewer opportunities for our youth, I am concerned that the loss of the Impact Zone will precipitate a sharp decline towards former dangerous conditions. 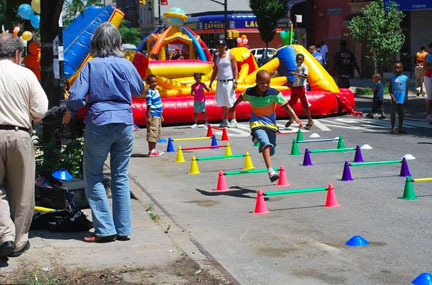 I urge you to keep the Impact Zone on Franklin Avenue. 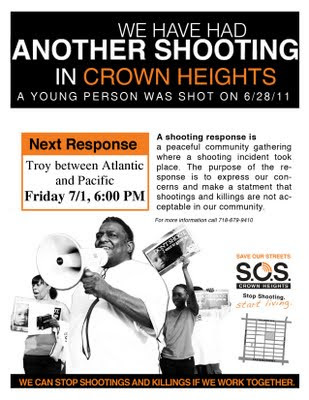 Save Our Streets Crown Heights is hosting a shooting response today (click on the flyer above fore more information). If you want to get more involved with SOS Crown Heights and the very important work they do, they're hiring a Program Manager.